Tea drinking is a long-standing tradition in Asia. With a lot of tea establishments continuously sprouting all over the metro, it has become a part of contemporary pop culture. Happy Lemon takes tea to a different dimension. You could say that they have a type of tea for almost every mood, personality, and preference. Happy Lemon is an international brand that first opened five years ago in Hong Kong, but now has over 100 branches all over the world. You will find them in Hong Kong, China, Singapore, Australia, and now the Philippines. 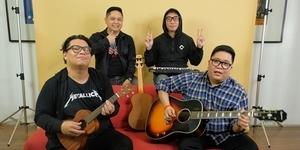 Interestingly enough, it was brought to Manila by a group of tea-loving friends, comprised of siblings Kelvin and Kristine Gaisano, basketball player Chris Tiu, and their friends Andres See, Charles Chua, Wesley Pardilla, and Edward Go. It is under the company Happy Lemon Group Philippines, Inc.
Chris Tiu and the rest of the Happy Lemon gang divulge the secret to being "Happy Everyday!" Watch this clip to learn more about the newest bubble tea store at Promenade, Greenhills. 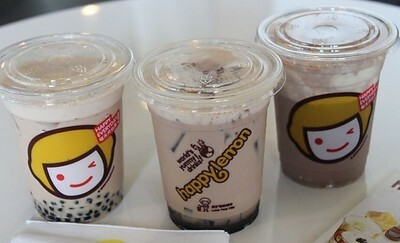 Happy Lemon is not just limited to milk tea, they also have other specialty drinks. Their beverages are divided into collections, they have the Lemon Series, Rock Salt and Cheese, Milk Tea, Mousse Spin, Cocoa and Coffee, Specialty Drinks, and Fresh Tea. Drinks in the Lemon Series are all lemon-infused, while those in the original Rock Salt and Cheese are a unique combination of rock salt and cheese to tea, coffee and cocoa. 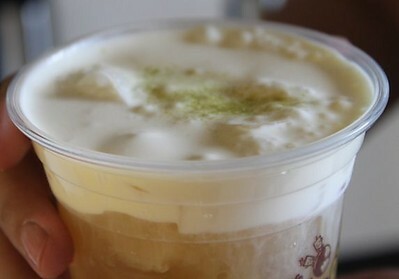 The Mousse Spin drinks are ice blended refreshments mostly preferred by children but also a hit among adults. The Fresh Tea are exotic but refreshing. 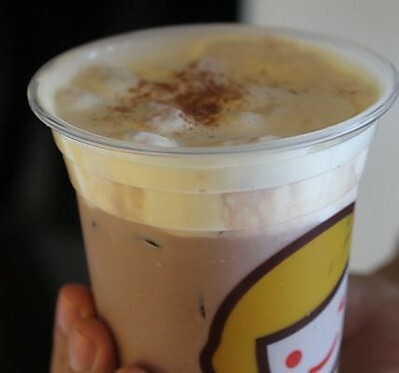 Their most sought-after drinks fall under Rock Salt and Cheese, and Milk Tea. Considering the quality of ingredients used, the drinks are reasonably priced, with prices ranging from P75 to P110. I was lucky enough to taste some of their best selling drinks. The first one I had was the Milk Tea with Black Pearl Sago (Regular – P75) then I tasted the Coca Milk Tea with Puff Cream (P85) and Crispy Cocoa Milk Tea with Brown Sugar Jelly (P85). These drinks are milk tea based but what sets them apart are the toppings. This collection is perfect for all the milk tea lovers out there because of the exquisite milk tea blend. 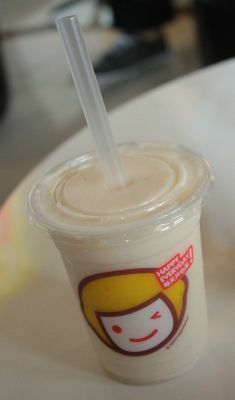 The Lemon Yakult (Regular – P90) mousse spin is perfect for this summer because it's simply refreshing. The lemon bits add texture and the flavor tingles in your mouth. The Rock Salt Cheese has to be my favorite collection. You can have it either with Green Tea (Regular – P80), Cocoa (P90), or Coffee (P90). Part of the experience is sipping it without a straw, since the cheese is on top and it's fun licking it off your upper lip. I never would have thought that rock salt and cheese would compliment green tea, but trust me when I say that this combination of ingredients is what I consider a taste of heaven. 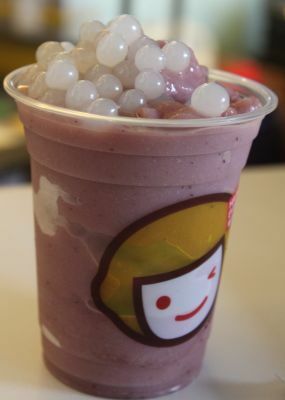 Their latest innovation is the Blueberry Mousse Spin with Popping Boba (Regular - P100). 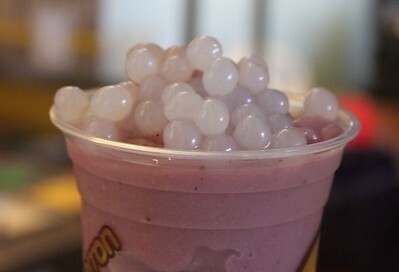 Popping boba is sago filled with juice and it is an explosion of joy in your mouth. Imagine that with a refreshing blueberry mousse spin. After having this drink, I was in a state of bliss. These are just some of the noteworthy drinks on their menu but there is still so much to choose from. 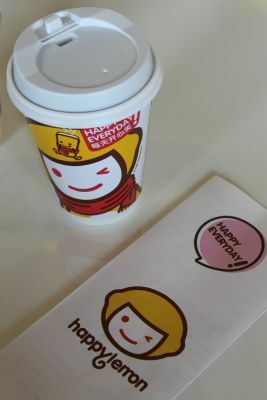 With the positive vibe you get from the ambiance and that delicious drink in hand, you'll surely leave Happy Lemon feeling happy. 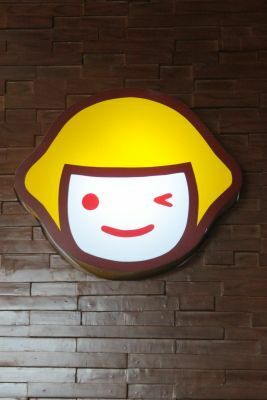 Their first branch in the Philippines is located at the 1st Level of the Promenade in Greenhills. 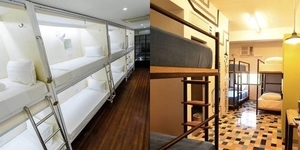 They are expected to come out with more branches within the year, one is set to be in Eastwood Mall, and another at the Rockwell Power Plant Mall.